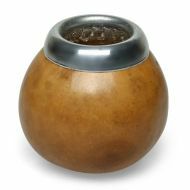 With use the ‘calabaza’ will absorb the colour of the tea due to the fact that the pores absorb the ingredients of the tea. 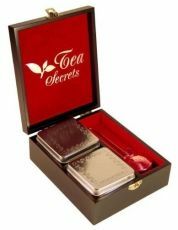 Wooden box containing two boxes for storage of tea and 50 g measuring spoon (stainless steel). 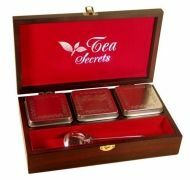 Wooden box - corner, L 23,3 x B 17,5 x H 6,3 cm, mahogany color, inside cover - red velvet. 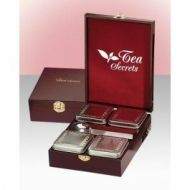 Wooden box containing 3 boxes for storage of tea and 50 g filter spoon (stainless steel). Wooden box - corner, 183x157x63mm, mahogany color, inside cover - red velvet. 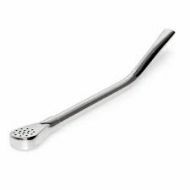 Boxes - capacity 50 g, silver matt.